Grown in the foothills of the Himalayas, basmati is small, long-grained non-glutinous rice. Brown basmati, being less processed than white rice, retains its whole-grain nutritional value. Basmati has the highest content of all rice for amino acids and essential nutrients. Rice is also healthy for what it doesn’t contain: fat, cholesterol, sodium and gluten. According to Food Insight, the U.S. Food and Drug Administration permits manufacturers of foods containing at least 51 percent whole grains by weight, which are low in fat and cholesterol, to display a label claiming the product lowers risk of heart disease and certain cancers. Basmati is a good source of complex carbohydrates, providing energy for the brain and central nervous system. One cup of basmati contains 216 calories, 45 g of carbohydrate and no cholesterol. In fact, Louisiana State University conducted a study, published in the American Journal of Clinical Nutrition, showing that oil in brown rice reduces the levels of LDL, or “bad” cholesterol, in volunteers with moderately elevated cholesterol levels. Basmati provides 10 percent RDA, recommended daily allowance, for protein per cup of rice. Although it contains all eight essential amino acids, it is low in lysine. Since beans contain lysine, combining rice and beans makes a complete protein meal. The most beneficial nutrient found in basmati rice is manganese, essential for the metabolism of protein and carbohydrates and regulating your nervous system. You receive 88 percent RDA for manganese with just one cup of cooked rice. Basmati is an excellent source of magnesium, a co-factor for enzymes’ involvement with the body’s glucose and insulin secretion. Deficiencies of magnesium can contribute to high blood pressure and muscle cramps. One cup of cooked basmati supplies 21 percent RDA. Other minerals found in a cup of basmati rice include calcium, 19.50 mg, copper, 0.20 mg, potassium, 83.85 mg, and zinc, 1.23 mg.
Vitamin B is necessary for breakdown of carbohydrates into glucose. It also affects functions in the brain and stabilizes mood. The predominant B vitamins found in basmati are niacin, vitamin B6 and vitamin B1, thiamine. One cup of rice provides 15 percent RDA for niacin, important for proper blood circulation and digestion. Vitamin B6 aids in the body’s metabolic functions and may prevent cardiovascular disease. Vitamin B1 ensures healthy red blood cells and helps with normal function of the nervous system. Pantothenic acid, riboflavin, folate and biotin round out your vitamin B requirements. Other vitamins include the antioxidant vitamin E, vitamin K for blood clotting, and iron for maintenance of red blood cells. Brown rice provides twice the fiber of white, the bran of the rice being the highest source. Fiber is necessary for keeping the bowel healthy and decreasing the risk of colon cancer. Selenium, a trace mineral, also reduces the risk of colon cancer. 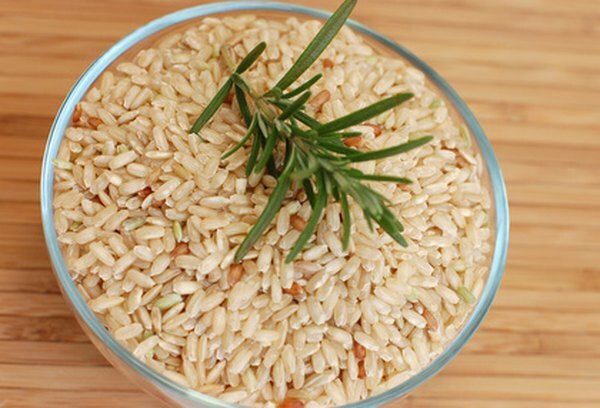 In addition to supplying 14 percent RDA for fiber, basmati contributes 27 percent of your daily selenium requirements. Muscle and Strength: Vitamin B Information & Product List: What are the signs of vitamin B deficiency?